I suppose any number of factors could compel a person to march into the kitchen and start cooking, but for most of us it probably comes down to the very basic understanding that food made by our own hands simply tastes better than the alternative. It was that belief, anyway, that was rattling around in my head as I set about assembling this week’s recipe for tabouleh—an item that’s generally available in most American grocery stores, and that’s often pretty good in its pre-packaged, ready-made condition. So why make it yourself? Well, for starters that supermarket variety is generally only sold in those little plastic tubs, which means that if you’re planning on feeding more than one person, you’re looking at ringing up quite a little tower of containers when you get to the checkout line. But more importantly, what tastes satisfactory when you’re eating alone at your desk or grabbing a ten-second snack while mindlessly studying the interior of your refrigerator is naturally held to a higher standard when others are involved. 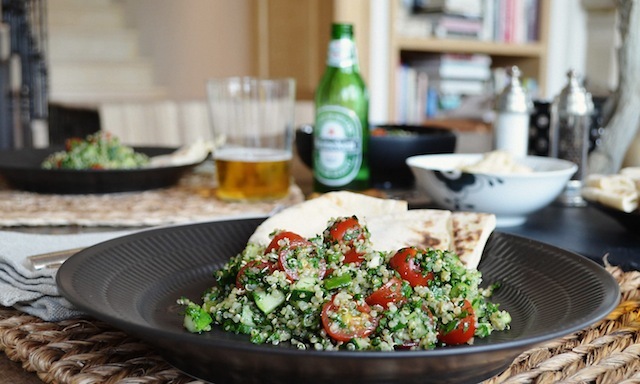 This tabouleh is for those occasions—it’s the one you serve when company comes or when you just want to sit down at the table and have a proper meal. The recipe comes from the June issue of Bon Appetit and differs from most other versions of the dish that I’ve seen in that it calls for quinoa instead of bulgur. Quinoa, of course, is a grain (alright, a seed if you’re going to get all technical) that’s popping up on restaurant menus a lot these days, and in everything from breads to risottos. In my experience, though, its slightly grassy flavor lends itself best to salads, making it ideal for an updated version of this Middle Eastern classic. 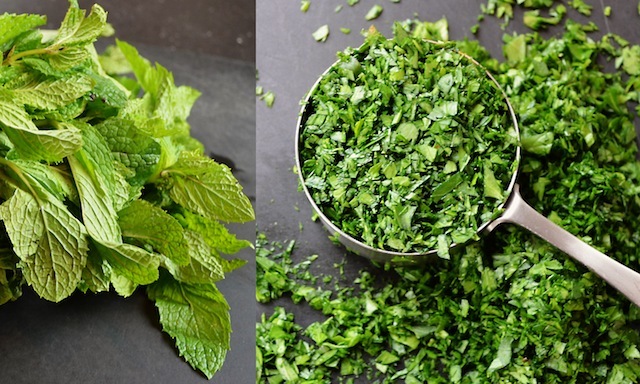 Which means that here it’s the combined flavors of lemon juice, parsley, olive oil, and mint—the principal flavoring components of tabouleh—that round out the earthy quality of the quinoa. It’s a bright zesty combination that’s unlikely to be found in any version of the salad that hasn’t gone directly from kitchen to table, in large part because they’re flavors that tend not to last all that long. That’s particularly true where quinoa is concerned, as its slightly spongy couscous-like quality (bulgur tends to have a nuttier flavor and drier texture) has a way of zapping the life out of the combined ingredients over a prolonged period. In other words, this is not a great candidate for a make-ahead meal or even for leftovers. That fleeting quality is one of the drawbacks of tabouleh. The good news, however, is that assembly is fairly simple and involves only a handful of ingredients. Here, the process begins by simmering a cup of quinoa in a small amount of water for ten minutes, letting the “grain” sit undisturbed for five minutes before fluffing it with a fork (much as you would a quantity of rice), then allowing it to cool completely in a large baking sheet—a process that takes little more than fifteen minutes or so. While the quinoa cools you can set about preparing the dressing (a clove of garlic, a few tablespoons of fresh lemon juice, and a 1/2 cup of olive oil, all of it whisked together), and chopping the various ingredients that will be folded into the quinoa—the parsley, the mint, the cucumber, and the cherry tomatoes. True, those herbs are a key component here so the plucking and mincing of the leaves can take more than a few minutes, but that’s essentially the extent of the heavy lifting. So even with those knife skills called into play, this is a salad that can be thrown together in a half hour or less. 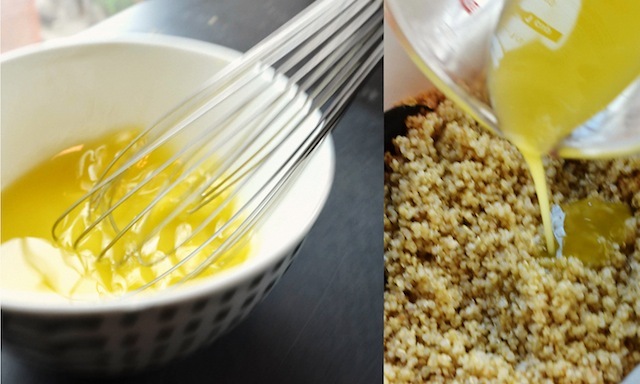 Still, if circumstances call for getting some of the work done in advance, you can always prepare the quinoa and the dressing up to twenty-four hours ahead of time, mixing the “grain” with a ¼ cup of the lemon juice/olive oil mixture, then covering and refrigerating the moistened quinoa and the remaining dressing separately. 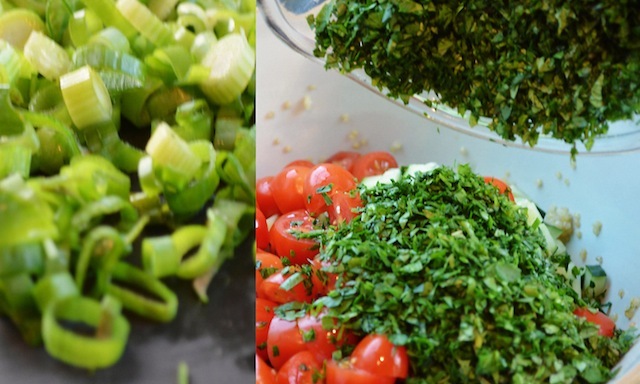 Just be sure to hold off chopping the herbs and the scallions as long as possible, as you don’t want these key flavoring components to lose any of their all-important punch. Either way, the reward is something bright, light, and zesty, a perfect side dish or vegetarian entrée for a sultry summer night. In other words, seductive food for seductive weather—though if actual seduction is on the menu, be sure to keep the dental floss handy (such are the hazards of herb-heavy dishes such as this one). *English cucumbers are generally sold wrapped in cellophane; Persian cucumbers are slightly smaller, between 5 and 8-inches long. 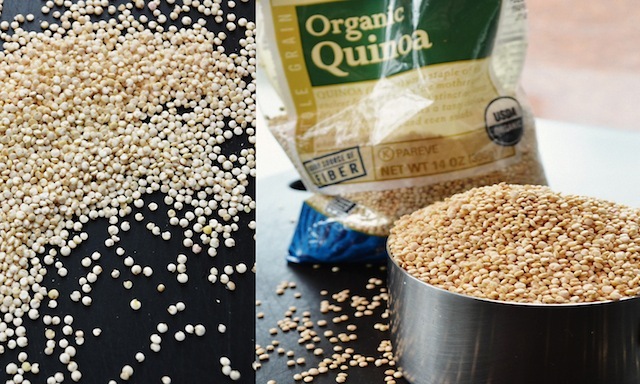 —Bring quinoa, ½ tsp salt, and 1¼ cups water to a boil in a medium saucepan over high heat. Reduce heat to medium-low, cover, and simmer until quinoa is tender, about 10 minutes. Remove from heat and let stand, covered, for 5 minutes. Fluff with fork. 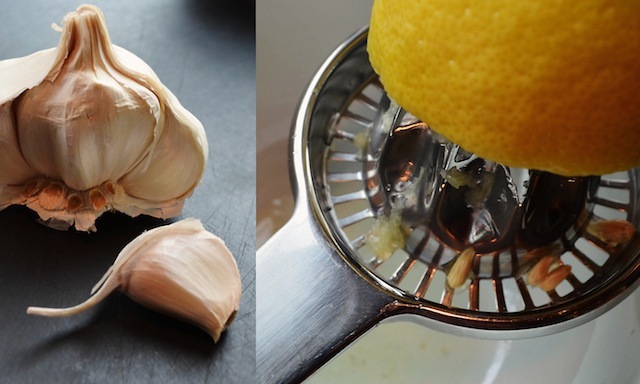 —Meanwhile, whisk lemon juice and garlic in a small bowl. Gradually whisk in olive oil. Season dressing to taste with salt and pepper. 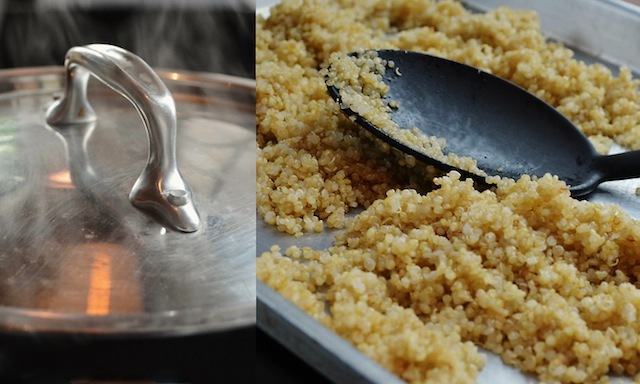 —Spread out quinoa on a large rimmed baking sheet; let cool. Transfer to a large bowl; mix in ¼ cup dressing. NOTE: Recipe can be made 1 day ahead to this point. Cover remaining dressing and quinoa separately; chill. 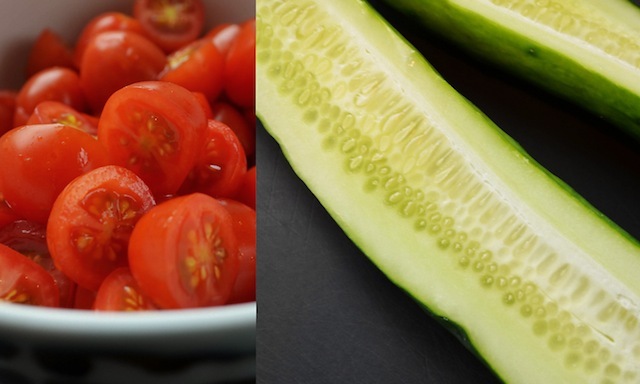 —Add cucumber, tomatoes, herbs, and scallions to bowl with quinoa; toss to coat. Season to taste with salt and pepper. Drizzle remaining dressing over. Note: I won’t be posting next week as I’m going to be on vacation. 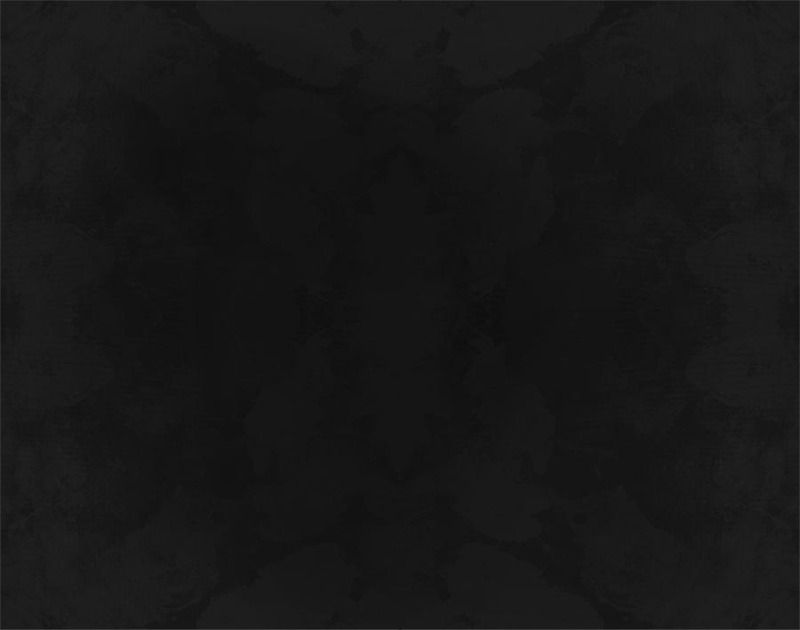 I’ll be back with a new recipe on Thursday, the 12th. Have a great July 4th everyone! 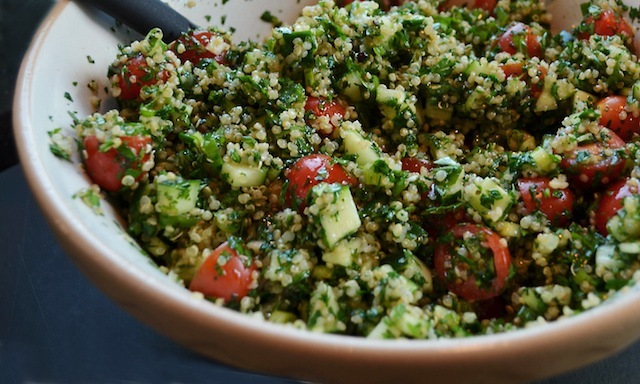 RecipteGrinder - this Quinoa update to tabouleh is a great idea! Thanks!!! RecipeGrinder - this tabouleh update is great. Thanks!!! 06/11/14 • BRAISED FISH "STEW"